Left: Portion of the Gemini spectrum of PS1-11bam from December 5 containing several interstellar absorption features of Fe II and Mg II at z = 1.566 (black). The error spectrum is shown in blue. For comparison we plot the GRB composite spectrum of Christensen et al. (2011). 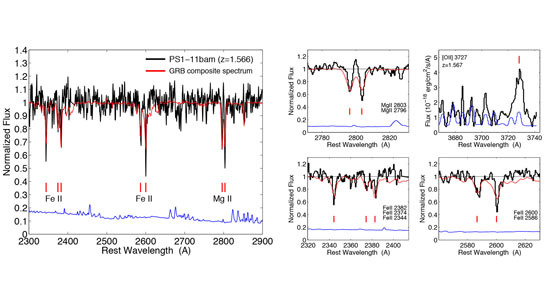 Right: A zoom-in on the relevant Fe II and Mg II lines demonstrates the similarity to GRB absorption spectra. Also shown is the [O II]3727 emission line at z = 1.567 from the January 1 Gemini spectrum. The discovery of the dying star in this distant galaxy was made using images from the Pan-STARRS1 survey telescope on Haleakala in Maui, Hawai‘i. “These are the types of exciting and unexpected applications that appear when a new capability comes on line,” said John Tonry, one of the study’s co-authors and supernovae researcher at the University of Hawai‘i at Manoa’s Institute for Astronomy. Tonry adds, “Pan-STARRS is pioneering a new era in deep, wide-field, time-critical astronomy – and this is just the beginning.” After the Pan-STARRS discovery, spectroscopic follow-up studies using the Multiple Mirror Telescope in Arizona and the 8-meter Gemini North telescope on Mauna Kea, Hawai‘i provided the data used by the team to probe the gas of the distant galaxy’s interstellar environment. The spectra revealed the signatures of a distant ultra-luminous supernova, and equally important, the unique fingerprints of iron and magnesium within the distant galaxy that hosted the explosion. The galaxy itself contains a very young population of stars (~15 to 45 million years old) with a mass totaling some 2 billon Suns. The ultra-luminous supernova explosion belongs to a relatively recently-identified and special breed of exploding stars. They are some 10-100 times more luminous than their ordinary less-energetic cousins and unusually blue in color. While the process leading to their demise is still being explored, evidence points to the central core-collapse of a star having as much as 100 times the mass of our Sun. The collapse triggers an enormous explosion that blasts prodigious amounts of heavier elements through the star’s enormous outer layers before expanding into space. Be the first to comment on "Scientists Use Light from an Exploding Star to Study Distant Galaxy"